Back in 2009 my beautiful daughter was selected by Mother and Baby Awards to test and review products for the Best Product for Weaning and Best Baby Food (Stages 1,2 and 3) categories. We had such a wonderful time trialling the products and they were certainly well used and well travelled as we took most on holiday with us! It was lovely to have our opinion and feedback taken on board, even more so that the products that were outstanding received an award for their hard work in ensuring their products are best for baby and also best for the parents too! The products we tested last year made such an impact on my family that we did actually change our formula – after researching I found the brand we tested suited Olivia more and we were happy with how she adapted so quickly to using this product that we changed to this particular brand for the remaining time that she used formula. The weaning products that we also tested included several training cups and they have been well used over the past 12 months and have been the topic of many conversations between my mummy friends. We love the Mother and Baby Awards and the fact that we can be part of such a large, industry renowned testing panel but the fact our opinion is taken on board whether good or bad. For further information on the Mother and Baby Awards and testing please view Jessica’s blog – she is the wonderful and very hard working co-ordinator behind the Awards and certainly does a fanastic job to ensure it all runs super smoothly! This year (2010) I was shocked and over to the moon to find out that we would be testing the Best Car Seat Group 1 category. For us it could not have come at a better time as the same day I received confirmation our car seat that we had enjoyed using decided to jam so that we could not use it. This car seat had seen us travel to the South of France to visit my parents, several trips to Norwich to see the in laws and basically journeys all over the country and many trips to the airport to drop my husband off to catch his plane for work. As a courier (only on a Saturday!) I really do need a car seat I can truly rely on as my area I cover is very rural and some of the roads are hairy at the best of times, you add rain or snow and it feels like I could put some of the rally drivers to shame!! Well before I start commenting on the fabulous car seats we are testing I will mention that our original car seat was replaced and both companies involved who we dealt with were wonderful. They obviously care deeply about safety and child protection whilst in a car is paramount. For the Mother and Baby Awards 2010 we are testing and reviewing 4 completely different car seats – all Group 1 – and are in a fortunate position that I live on a wonderful close with many neighbours who have children of a similar age to Olivia who can also contribute by testing the seats. It also means there is less hassle swapping the seats over on a weekly basis although I must look bizarre to people who have no idea whats happening, lugging the seats up and down the close! 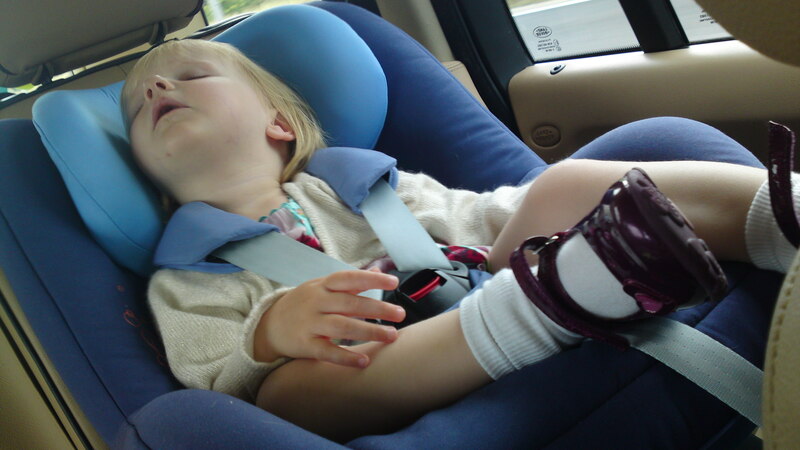 Currently in our car we are testing the Maxi Cosi Pearl and FamilyFix Base which is for an Isofix setting – for us this car seat is absolutely perfect due to the long journeys we take. Olivia can be well reclined in this seat – more reclined that any other I have seen and it is well padded for extreme comfort. I am sure Liv will forgive me for posting this image one day but as you can see she is extremely comfy and content in this car seat and we are very reassured when using this car seat. A more detailed review will go live when all testing is complete.